Crafts : Plastic toys are discolored? Here are 10 amazing transformations! Plastic toys are discolored? Here are 10 amazing transformations! 10 amazing transformations that will inspire you! If you have a Little Tike home or toy outdoor, it's probably probably very discolored! The sun discolors everything that stays outside too much longer, even our children's toys. Fortunately, the paint brand Krylon has released a paint for our children's plastic toys! 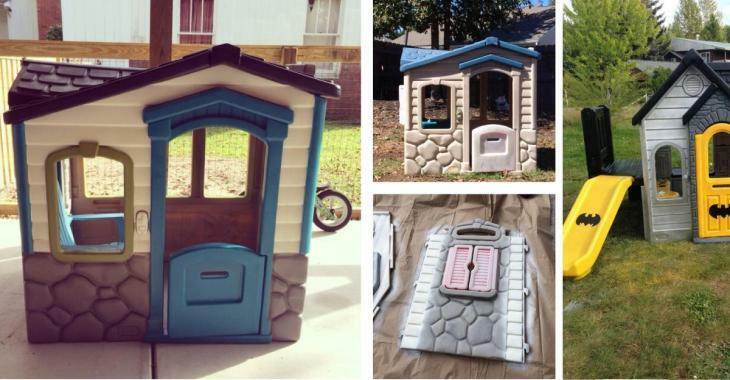 So you can paint your children's toys to give them a second life! These toys cost a small fortune! Use them as long as possible! Here are 10 wonderful transformations to inspire you! You will find the picture of the paint at the end of this article! 1) After repainting the house, why not build a small patio? Do you still have extra materials after you made your patio? You'll know what to do with it! I'M LOVING IT!!!! 2) Realistic colors are also very beautiful! 3) It is even possible to paint with a lighter color than the original color! 4) Will you dare vibrant colors !? How pretty it is!! 5) Would you have imagined being able to repaint this one? It is beautiful !! You will understand that the state of the toy is not important. First you must wash the plastic and let it dry before painting. 6) DARE MIXING THE COLORS! 8) Think about the combination of colors you would like! 9) You will be able to choose a theme too! Here we chose Batman! 10) Separate the pieces for a meticulous work! Here is the paint you will need! The Krylon brand for plastic that dries in less than 10 minutes.We can find it in all superstores and hardware stores!